Side-scrolling strategy is back, baby! Swords & Soldiers II Shawaramageddon is real-time strategy without the clickety clickety, where you command the Vikings, Demons, and Persian armies. You can take on the campaign or face off against other players in online multiplayer and challenge your friends in custom battles! Gather resources, send out armies, and support your forces with a wide arsenal of magical spells – all from a side-scrolling perspective. That doesn’t mean Swords & Soldiers II Shawarmageddon is easy to master: only the most cunning of Chiefs can lead their side to victory! Think you’re beard enough? Prove it in online matchmaking! 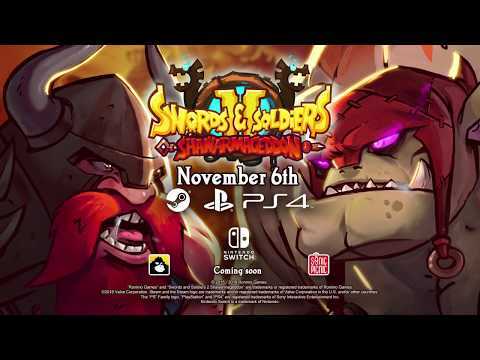 Swords & Soldiers II: Shawarmageddon was released on Switch 50d ago in the US and the UK.